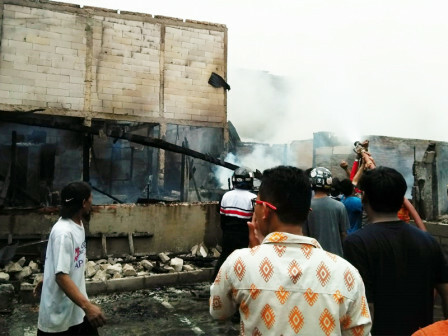 Fire gutted dozens of semi-permanent houses on Jalan Pesing Garden RT 16/RW 03 Kedoya Utara Urban Village, Kebon Jeruk, West Jakarta, Friday (11/9).
" After 15 minutes later, firefighters arrived at the location to put out the flames and managed to control it an hour later"
West Jakarta Fire and Rescue Sub-dept. 's Operation Section Head, Rompis Romlih stated that 18 fire trucks were deployed to the scene after getting a fire report from locals at 10:15 AM. "After 15 minutes later, firefighters arrived at the location to put out the flames and managed to control it an hour later. No fatalities and casualties in this fire incident," he expressed. Allegedly it was triggered by electricity circuit. "We're still recording the number of burned buildings and the losses incurred," he said.